This all in one shoe cleaning kit features everything you need to shine and maintain the look of your shoes. Ideal for keeping your shoes perfectly polished whether at home or traveling. The shoe polish has a gloss finish which is waterproof and nourishes the shoe. 1. Before starting to polish shoes, remove the laces from the shoes. 2. Clean the dirt and debris from your shoes. For the best results, use a brush to carefully brush the soil between the stitches and the shoelace, then use a clean cloth or a damp rag to clean the shoes and allow them to dry before applying shoe polish. 3. Apply right amount of shoe polish on the vamp, let the shoe polish be evenly applied to the vamp by sort cloth, pat gently with a brush, let shoe polish nutrient penetrate into leather. 4. Wipe the shoes slowly with a soft cloth until the shoes are bright, and make sure the shoe polish do not touch the pants. 1. Do not use for suede, matte surface and oil leather products. 2. Apply it evenly and do not let it pile up. 3. Please try it in a small area first, then use it normally after being satisfied. 4. keep it away from childrens. Keep Vamp Bright And Clean Wherever You Go: Shoe shine travel kit is lightweight, portable and comes with a convenient, elegant travel case. With this set, you can keep your shoes vamp bright and clean no matter where you are! 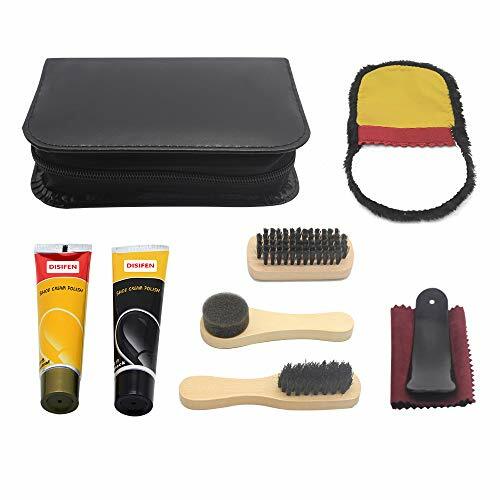 All Inclusive Shoe Shine Bundle: The shoe care ckeaning kit contains every piece of equipment you may need to keep your shoes clean and polished. Excellent Quality And Design: The best quality accessories in shoe shine kits. Each piece designed and crafted to ensure practicality, durability, and function. Great Gift: It will be a great gift for men, spouses, your boss, dads, young professionals or special occasions like wedding. Multiple Uses: Shoe polish can use for leather shoes, leather clothing, leather bag, leather belt, leather glove, leather car seat, leathe sofa.